Many decisions made in this world are based interpreting geospatial data – usually 2d maps that represent spatial relationships between objects. Geographic information systems (GIS) are now commonly used to represent such maps in a computer. While maps are convenient for many tasks, sometimes their 2d layout makes interpretation of underlying data difficult for human users. For instance, suppose Figure 1 represents a river with arbitrary shape. Determining the approximate length of this river is hard for a human user and would become much easier if the river is mapped only a nearly linear shape as in Figure 2. The GIST-API is a web-based visualization API, designed to implement the transmogrification concept 1 for the web-based GIS applications. The transmogrification process in the GIST-API [Figure 4] starts with providing a curve to the shape module to create shape. The shape is the combination of curves (i.e. top, spine and bottom curve). After the shape is created this shape is passed into the transmogrification module, which uses shape and graphics (i.e. maps) to create transformed graphics. Figure 5 Application created using GIST-API. In this screenshot (1,2,3,4,5 and 6) has been transformed into an easily comparable rectangle (1’,2’,3’,4’,5’ and 6’). User is comparing the distance between two places to check which one is longer. 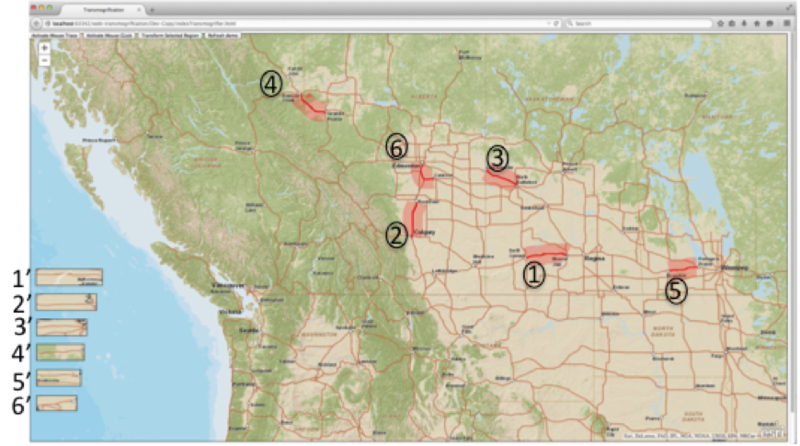 Currently, this API only supports GIS applications designed using the ArcGIS mapping services. Currently, the shape is created on the screen is using screen coordinates. In future, we plan to use geo coordinates instead of screen coordinates. We also plan to extend the GIST-API with other mapping services like Google Maps, QGIS. 1 Brosz, J., Nacenta, M.A., Pusch, R., Carpendale, S., Hurter, C.,”Transmogrification: causal manipulation of visualizations”. In proceedings of UIST ’13, p.p. 97-106.